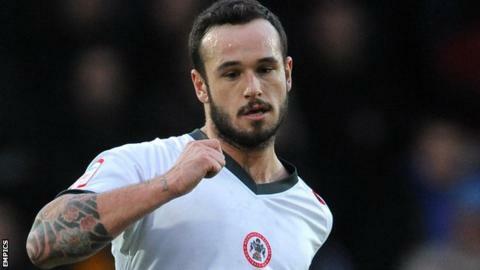 Lee Molyneux scored two stunning goals as Accrington defeated Rochdale to move out of the League Two relegation zone. Dale had the better of the first half with both Ritchie Jones and Jason Kennedy glancing headers wide and Terry Gornell flashed just wide of the post. Molyneux, on as a second-half substitute, scored his first from long range, smashing into the top corner. The former Everton trainee drilled in a 25-yard free-kick before midfielder Rommy Boco stroked home a third. Keith Hill's side looked much more likely to open the scoring and dominated possession, while Stanley managed only one effort on target in the first period. But the introduction of full-back Molyneux on 60 minutes changed the game as his two long-distance strikes handed Accrington their first win in eight attempts and lifted Stanley out of the bottom two. "We've witnessed two spectacular goals from the opposition. The first one was right out of the top drawer and the second one equalled it. "Molyneux scored two and created one - there's the benefit of the substitution. "For 75 minutes I was reasonably happy. I thought we were the better footballing side and we just haven't got that penetrative edge in front of goal at the minute." "You don't deserve to play well every week, but what you can do is work hard. If you do that through the week, you'll get your rewards and we got that tonight. "They're three fantastic goals to win a game and for the last month we've deserved that. "Lee Molyneux's not played the last couple of games, but he's got all the attributes. That's how to react. We asked the lad to go out and affect the game - he's certainly done that."